The Under the Tree Designer Paper in the Holiday Catalog comes in 12 x 12 size, 12 sheets: 2 ea. of 6 double-sided designs. Cardstock - weight kraft sheet with color print on one side, white printed patterns on the other. For this card, I used two pieces of the same print. Here is how I made this card. 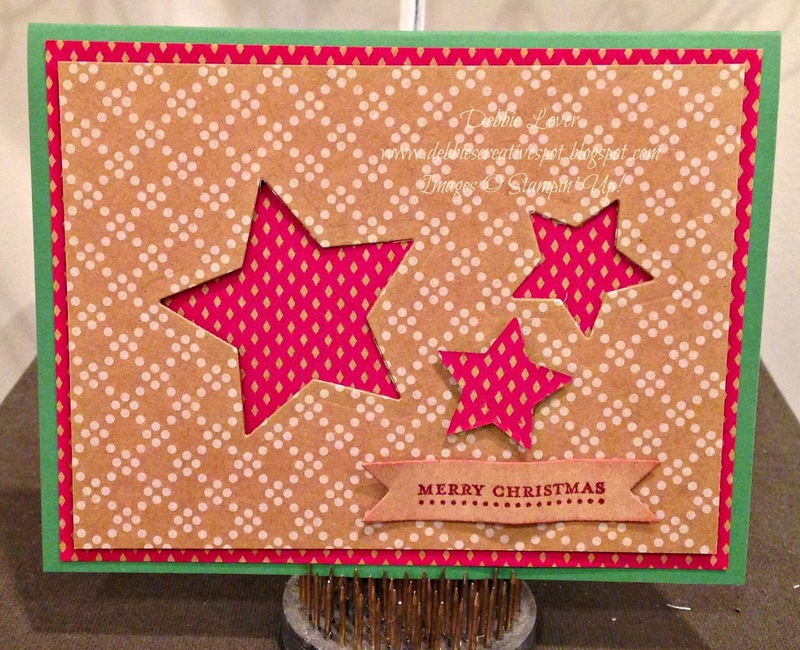 Place two smaller stars from the Stars Framelits collection on the kraft/white piece of cardstock and run through the Big Shot to cut out. Adhere the red piece with adhesive, put dimensionals on each corner of the star piece and place on top. Put a dimensional on the back of the small star that was cut out and put in place. Stamp Merry Christmas from Teeny Tiny Wishes onto a scrap piece of Kraft Cardstock and cut out with the Bitty Banners Framelit. Sponge edges and use glue dots to put in place.